We know little about British author Barnard Stacey apart from the details of his birth and death. He was born Harold Charles Barnard Stacey in Hampstead, London, on 8 May 1889, and died in Newton Abbot, Devonshire in December 1973. Stacey appears to have been most prolific in the short story form, and his stories first began to appear in British periodicals around the mid-1920s. His stories were apparently syndicated in various newspapers following their initial publication in magazines such as Complete Stories, 20 Story Magazine, The Passing Show, Mystery Stories, and The Adventure and Mystery Story Magazine. Various of the author’s stories were reprinted in Australian newspapers and magazines, and it’s possible that there was further syndication in other countries. Stacey’s stories can be divided between three genres: romantic, crime and supernatural fiction. Though a good writer in each of these fields, Stacey clearly found that the mystery story—whether criminous or supernatural—was his forte, and most of his published short fiction appears to fall into such category. Despite the aforementioned details of the original publication of “The Devil’s Ape,” this story had apparently already been published as early as 1925 under the title “The Man Who Went to The Devil.” The earlier version of the story is substantially different to the version later entitled “The Devil’s Ape,” and is included in this collection as an appendix. From the late 1930s into the 1940s several stories and plays by Stacey were broadcast by the BBC on its Regional Service. These included “Identification Parade” (6 January 1939, an adaptation of the story included in this collection), “Lord Avon’s Crime” (a short play adapted from the story “The Terrible Crime of Lord Avon” included in this collection, aired on the BBC Home Service, 10 May 1944), “Do You Believe in Fairies?” (a half-hour play, BBC Home Service, 24 December 1946), and “The Tinker’s Curse” (a 45-minute play, 11 August 1948). 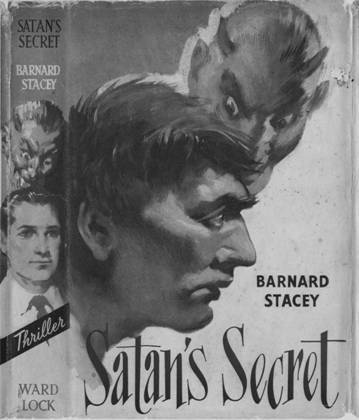 In 1956, Ward, Lock & Co., the large and well-established London publisher, issued Barnard Stacey’s sole novel, Satan’s Secret. Judging by the book’s relative rarity, the novel probably had just a single printing, and with no follow-up novel—and the author’s reputation having been based on his short stories—Stacey’s only published novel stands starkly in his oeuvre. Though the author was adept at the short story form, his one known novel proves that he was also proficient in the longer form. Satan’s Secret features thoroughly fleshed-out characters whose associations form a well-crafted web of connections intrinsic to the plot. The unfolding of the plot itself is unhurried, and, though the reader begins to form suspicions about the truth behind the mystery, Stacey sustains suspense by holding the revelations about the culprit and the details behind the crimes until the last few chapters. What led to the dearth of his published works after 1956? There appears to have been no published fiction after this time. The short stories by Barnard Stacey selected for inclusion in this collection reflect the author’s interest in the mystery story. Most of the tales are straight crime fiction stories, with well-rounded and believable characters. Some of the tales involve the popular theme of a possibly supernatural cause of a mystery being revealed in strictly mundane terms (albeit with a tantalizing hint of otherworldly atmosphere). Perhaps it is no accident that Stacey’s most famous story, “The Devil’s Ape,” is the most supernatural example in this collection. Even his novel Satan’s Secret—with its weirdly evocative title—remains luridly down-to-earth, with no hint of supernatural forces. A recurring motif in Stacey’s stories is the exotic animal as a plot device. Several of his stories involve snakes, and at least one centers around a Persian cat. There are other short stories by Barnard Stacey not included in this volume, but these selections provide an effective introduction to the intriguing mysteries created by an author who must, it seems, himself remain a mystery. The Times & The FictionMags Index (online). Ward Lock are renowned among aficionados of crime fiction for having published most of Norman Berrow’s mystery novels, as well as being the British publisher for many of the novels of Harry Stephen Keeler (Ramble House has prided itself on having reprinted all of the novels of Berrow and Keeler). Ward Lock published many works in the mystery genre which may have otherwise gone unnoticed.